It's Turkey time! We landed safely in Istanbul and have settled into our two bedroom apartment in Besiktas, on the Bosphorus sea. Today we hit the local transit, a bus and a street tram, for an adventure to Sultanamet. Here we visited the famous Aya Sophia, a museum that was once a Christian church and then a mosque built in the year 537AD. 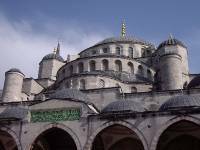 It is a stunning building with Incredible mosaics of Jesus and Mary and some of the Muslim symbols which were lit by chandeliers. Across the street was the Blue Mosque, famous for its ornate blue tiles and stunning skyline. You cannot miss this when looking at the city. We also visited a cistern basilica underground, built by a Sultan in the Byzantine era, and famous for its statue of Medusa...don't look her in the eyes or she will turn you to stone. The food we tried today was delicious...Turkish coffee and apple tea, sweet treats including Baclava and coconut tarts, and mezze (appetizers) with cheese, olives, eggplant, roasted peppers and bread. They sell bagels and twisty bread, as well as roasted corn from little carts on the street. We are content! Turkish delight is on the menu tomorrow. Defining moment today was the call to prayer. Here, four times a day, the mosques in every community put a call to prayer over their loud speaker, a tinny loud song in echoing sounds. It is a reminder to Muslims to come to pray to god. We witnessed many praying at the Blue mosque, with such devotion as they kneeled, bowed, kneeled and bowed. We watched as they sat cross legged before their teacher, eager for a word to touch them. If only I had such devotion to God, stopping my busyness and praying four times a day! I certainly come away with a better understanding of Islam today, but am reminded that Jesus is a prophet in their view, and that God, whom they call Allah, does not have a son. Tomorrow we will take the Bosphorus sea by boat, a cruise to the Asian side for a little lunch...did I mention it will be on another continent? More to come from Turkey!